So progress has been coming along fairly well on DSP. I’ve moved the text renderer over to a variable width font, which looks much nicer and gives more room for useful text. 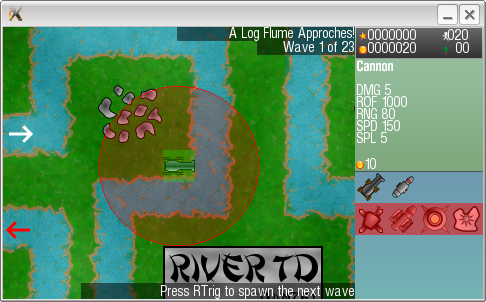 The Mouse UI is coming along quite well, the core game can be played through including tower research, wave details, etc. The only bits missing for an individual level to be properly playable is the ability to upgrade/sell towers, which I’m currently working on. The Gamepad (PSP) UI has fallen into disarray a bit. 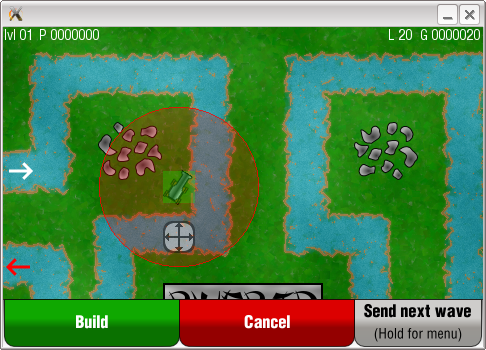 I plan to clean it up and port over some of the nice UI improvements from the Mouse UI to bring it up to scratch. Once I get the Mouse UI to a properly playable state, I’ll post a build for windows/linux/mac (and update the sourceforge SVN) which will let level devs (finally) try out the XML based level format. This entry was posted in DSP, PSP on November 6, 2008 by Danzel.